Welcome to Celtic-Knot Homestead’s home on the web. We are a family owned and operated dairy goat farm specializing in purebred LaMancha dairy goats since 1990. When we began the dairy goat adventure little did we know what an amazing role these animals would have in our lives. So much is to be learned from humbling ourselves, to work with our hands and to provide for ourselves. I, Jessica Aller, am herdswoman and sole manager here at ye ol’ homestead with contributions from my fellow dairy goat breeders and partners in crime, my mother and my newly married sister. 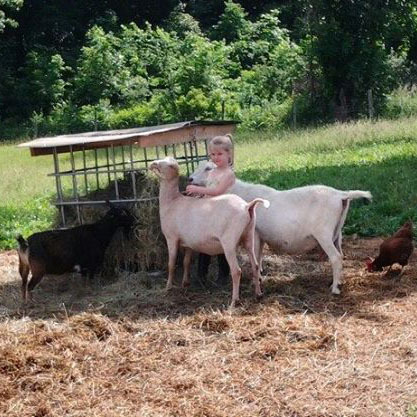 In addition to dairy goat herdshare information, pastured poultry (summer 2015), farm fresh eggs (fall 2015), goat milk fed pork (as available) you will find offered for sale; beautiful lucet cords, handmade cards, goat milk fudge and soothing udder butters. Thou shalt have goats’ milk enough for thy food, for the food of thy household, and for the maintenance for thy maidens. As a woman I find it extremely interesting that a special emphasis was given to maintaining the maidens…God must know just how unique goat milk is for all people and he gave a special provision just for maidens! Who am I to say no to that?